For the second year in a row we had nice weather for our annual event. 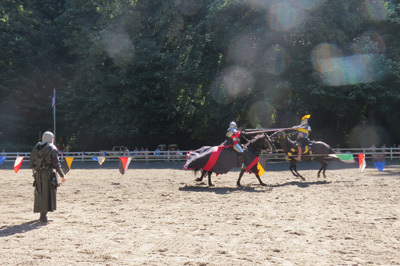 The entertainment this year was great, starting with the Seattle Knights - always lots of fun. New this year, we had the Seattle Bubble Man, and we brought back the super popular balloon man. The crowd was as large as we have had in years, and the pancake and bacon breakfast was, as usual, terrific. The pony ride was packed all morning, and the face painting resulted in some real works of art on the participants. And we had a good turnout for our 5 k and 10 k runs and the family adventure walk on a simply lovely morning to be out in the forest. Thanks to all the volunteers who worked to organize and manage the event, and to our many great sponsors! We will thank and list our sponsors in a separate post.